Lee & Cathy Jones: Windows Vista! We got a copy of Windows Vista Beta 2, the Business version. I have one of the newest laptops and the highest tolerances for beta software, so I installed Windows Vista and Office 2007 beta. The biggest thing is the Aero graphics interface. I saw a demo of it recently, and that is very cool. It is an almost-3d interface that does semi-transparent window effects, live. The coolest of these would be the 3d flip of tasks (screenshot) but I can't get that to work on my laptop. The transparencies on the program windows make for good eye candy. I must admit I really like the taskbar thumbnails. 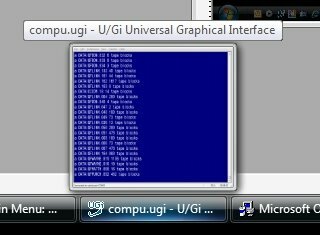 All my programs (the ones I care about) still work, so we'll see. 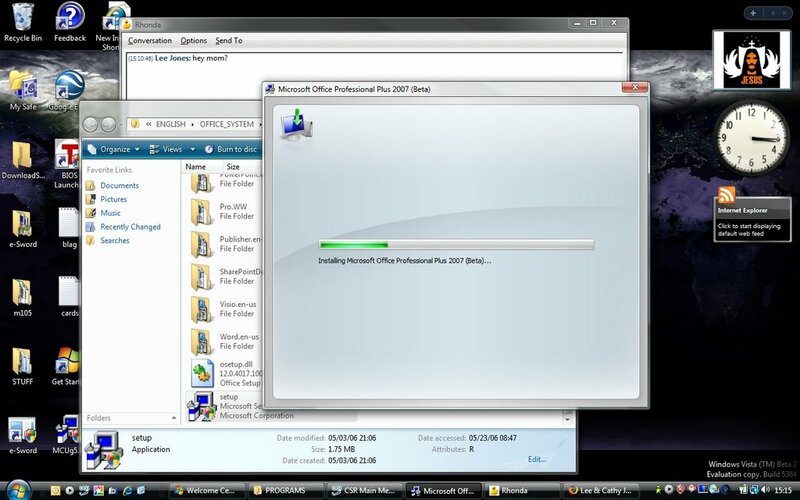 Office 2007 is just plain weird to me, at least for now. Hey Lee, me again. What's the Jesus thing in the upper right corner of your desktop? Hey, sorry it look so long to respond. In answer to your first question, you can get a copy as well at www.microsoft.com/betaexperience/engb/, assuming there are copies left. You may want to download and run the Vista Upgrade Advisor first. Since you have a gaming video card, you'll probably be fine. NOTE: this is a one-way process, so if you do this, back everything up first! NOTE: when the beta ends in six months, you'll need to reinstall a store-bought Vista or reinstall XP! Mostly it is eye-candy, but I actually like Office 2007. Oh, as for the Jesus thing... it is one of my desktop backgrounds.